What if a scarf could neutralize harmful emissions that you breath in on your commute to work? After a particularly polluted ride to work through Paris, Caroline van Renterghem founded Wair, an air-filtering scarf designed for cyclists. With designs for men, women, and children, the Wair scarf will protect lungs comfortably and fashionably. One morning, Wair’s founder van Renterghem was cycling through Paris as she did daily, when she found herself unable to go on. The emission levels that day affected her lungs so much, that van Renterghem had to stop riding, unable to breathe. She immediately looked into picking up an emission mask, but found them to be uncomfortable. Van Renterghem decided to fuse her experience in the fashion world, with a plan to protect cyclists’ lungs. Now in prototype form. the Wair scarf is meant to be both fashionable and effective, fitting snugly on the face without irritating skin. The scarf, which will come in varying styles and colors, is partnered with an anti-pollution device that monitors ambient air. When the device comes in contact with pollution, it activates the accompanying smartphone app that lets the cyclists know to put on the scarf. 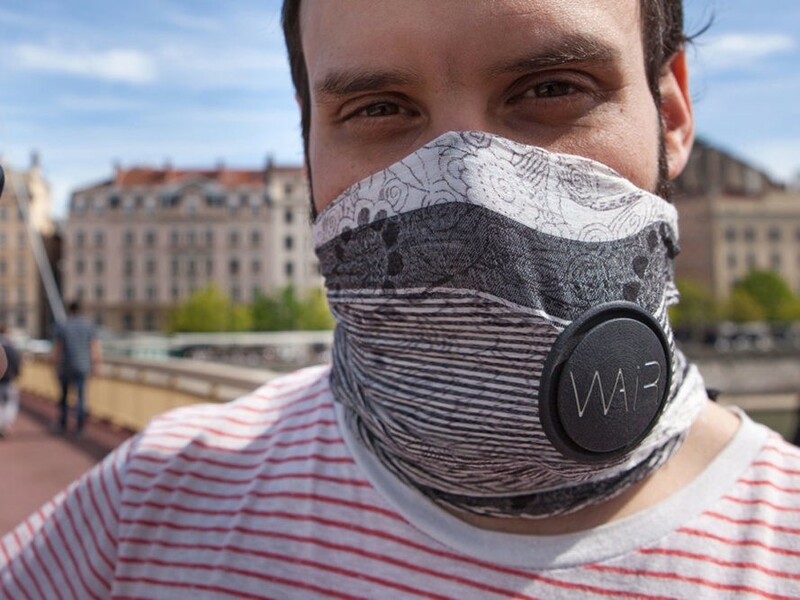 The app also keeps track of air quality, keeping emissions data absorbed by the scarf. Although the scarf is a prototype now, van Renterghem plans to launch the line, with just the scarves first, this summer. The scarf and device combination will be available in summer of 2017.